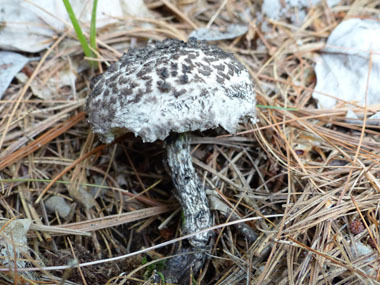 Overview: This is one of North America's most unusual edible wild mushroom. It is a dark, scurfy fungus that is gray-white with tufts of black hair on the cap and a fine layer of dark fur on the mushroom's stem. 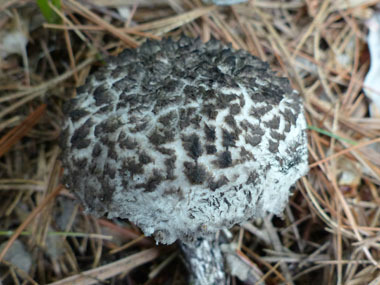 Distinguishing Features: This unique mushroom is greyish black, and has a shaggy cap and stalk. The cap is cushion-shaped, becoming flat with white flesh showing between the dark scales. It is covered with large, shaggy, soft, scales and the flesh is somewhat whitish. Pores are small; angular; grayish, bruising reddish then black. The stalk is slightly narrower toward the cap usually with one or two ring zones. The partial veil is greyish and sometimes it leaves woolly ring zones on the stalk. Height: 5 – 12 cm (2 – 5”). Habitat: On the ground in mixed hardwood forests and on occasion under a conifer. It especially likes oaks. Spore print: Blackish brown to black. 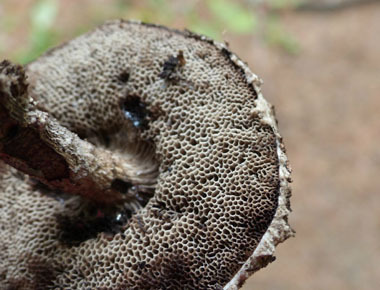 Gills: Pore surface is whitish, becoming grey to black. Pores are angular, 1 to 3 per mm and the tubes are up to 2 cm deep. Edibility: Young fungi must be cooked. They have a mellow, earthy flavour.